Rachel Carson's eloquent book Silent Spring stands as one of the most important books of the twentieth century and inspired important and long-lasting changes in environmental science and government policy. Frederick Rowe Davis thoughtfully sets Carson's study in the context of the twentieth century, reconsiders her achievement, and analyzes its legacy in light of toxic chemical use and regulation today. 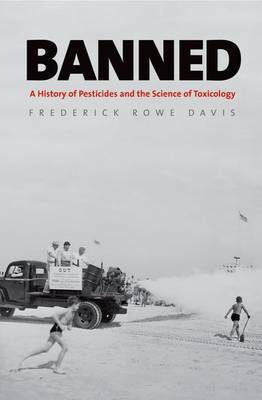 Davis examines the history of pesticide development alongside the evolution of the science of toxicology and tracks legislation governing exposure to chemicals across the twentieth century. He affirms the brilliance of Carson's careful scientific interpretations drawing on data from university and government toxicologists. Although Silent Spring instigated legislation that successfully terminated DDT use, other warnings were ignored. Ironically, we replaced one poison with even more toxic ones. Davis concludes that we urgently need new thinking about how we evaluate and regulate pesticides in accounting for their ecological and human toll. "Banned's emphasis on the development of toxicology is unique, compelling, and convincing. It is also crucial for understanding how Silent Spring was constructed, the controversy that swirled around its publication, and the impact it had on pesticide regulation in the United States. "-Mark V. Barrow, Jr., author of Nature's Ghosts: Confronting Extinction from the Age of Jefferson to the Age of Ecology -- Mark V. Barrow, Jr.